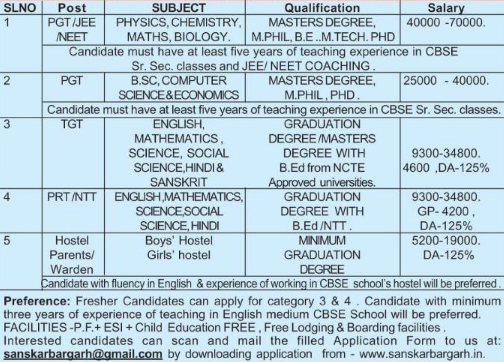 Sanskar International School, Odisha has advertised for the recruitment of Teachers PGT / TGT / PRT / NTT jobs vacancies. Interested and eligible job aspirants are requested to apply on or before 30th November 2018. Walk-in-interview will be conducted on 01st and 02nd December 2018. Check out further more details below. 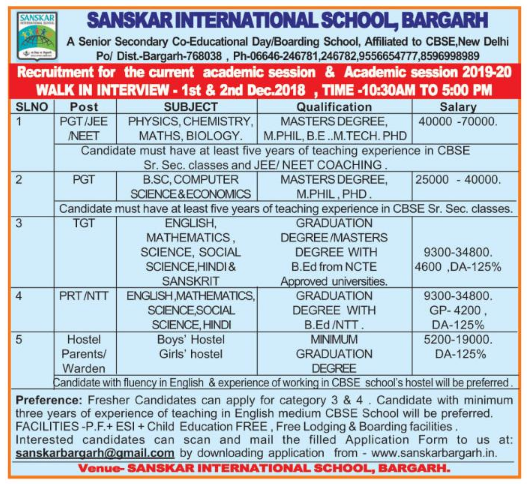 About School: Sanskar International School, Bargarh provides good quality, modern education, including a strong component of culture, inculcation of values, awareness of environment, adventure activities and physical education. New programs and innovative practices and activities are organized as a part of curriculum transaction for setting and maintaining higher standards of students' performance. How to Apply: Interested and eligible candidates are requested to send application along with their CV, copies of certificates and PP size photos to the following email address. Use the downloaded application from official website.